There are a few illustrations that I feel are too generic to fit this narrative, however, overall, I love the depictions of the characters and reading bits of the story on every other page! Will be coloring this one for a long time, that's part of the fun! Ok, so I colored and read it. Lol! I'm not a huge fan of coloring that involves pencils. It is hard to get the pencil to do right for sharp edges cause they break. I love the Outlander books for reading though. This took me over a year to complete the coloring. Just received this for my birthday. Not really sure that this should count towards my reading challenge, but I did read it! 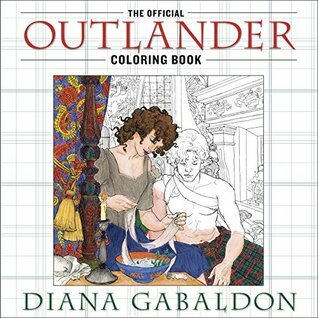 Passages from the novel are a nice addition to this coloring book--was not expecting this bonus. Now I need to get started coloring! I am determined to attempt to color this! I got this one to share with my dad who is a big fan of the books. There are some lovely illustrations to color in this one, can't wait to color them all. Ive read the book but I'm not done coloring it. Its a beautiful book! love it! I love this coloring book! It's beautiful.